Panasonic has announced two new TZ series travel cameras – cameras which are small enough to slip into a trouser pocket but with big zoom ranges to them extremely versatile. But these aren't just routine updates. The TZ80 (ZS60 in the US) takes the established design of the TZ range but adds a new, higher resolution sensor, while the TZ100 (ZS100) spears off in a whole new direction with a much larger 1-inch sensor and – we hope – a big hike in image quality. The TZ80 should appeal to traditional TZ travel camera fans looking for a compact, powerful and versatile camera with a wide zoom range, while the TZ100 is aimed more at enthusiast and experts who are willing to trade some of this zoom range for much better image quality. 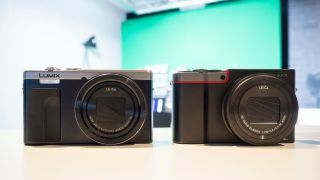 In fact, the TZ100/ZS100 looks like it will also straddle the high-end compact camera market, going right up against the Sony RX100 IV and Canon PowerShot G5X, but with a much longer 10x zoom range. We can't wait! The new TZ100 is the real headline-grabber, and it boasts a 1-inch 20.1MP sensor – the same sensor, in fact, as Panasonic's impressive FZ100 bridge camera. It's 4x larger than the 1/2.3-inch sensors used in previous TZ cameras and the bigger sensor means the individual photosites are much larger, despite the fact that's more of them. The new camera should deliver both more resolution and less noise at higher ISO settings. The TZ100 has a maximum sensitivity of ISO 12800 (25600 in extended mode). The drawback is that you only get a 10x zoom compared to the 30x zoom in previous TZ models (and in the new TZ80), but it's still pretty powerful, with a 25-250mm equivalent focal range and a maximum aperture of f/2.8-5.9. It's a Leica f2.8 DC Vario-Elmarit lens too, being used for the first time in a TZ/ZS series camera. It's no surprise to find Panasonic has incorporated 4K video – this has become the company's calling card in an increasingly competitive digital camera market. And Panasonic uses this 4K ability to offer 4K stills shooting – the TZ100 can capture 8MP stills at 30 frames per second for up to 15 minutes. 8 megapixels is still enough resolution to produce detailed A3-size prints, according to Panasonic. The TZ100's 4K options include Panasonic's latest Post Focus feature. Here, the camera captures a whole sequence of shots with different focus points so that you can select the one you want later. You also get Panasonic's DFD autofocus technology for super-fast AF – Panasonic claims an autofocus speed of just 0.1 sec – plus 10fps continuous shooting, or 5fps with AF tracking enabled. The TZ100 also has 5-axis hybrid optical image stabilization and a neat 'Level Shot' function that keeps the image level even if the camera is tilted. The TZ100 also incorporates an electronic viewfinder, full manual controls and can shoot raw files as well as JPEGs. This will boost its appeal to enthusiasts and experts looking for a powerful all-round camera. Wi-Fi is built in, but not NFC. The TZ100/ZS100 goes on sale at the end of March and will cost £529/US$699.99. The second Panasonic camera to be announced is the TZ80. This is much closer in design to Panasonic's previous top-end travel camera, the TZ70, sharing the same 1/2.3-inch sensor size and 30x zoom lens. This time, though, Panasonic has introduced a new 18MP 'high-sensitivity' sensor. The older TZ70 had only 12 million pixels – Panasonic's attempt to balance resolution with acceptable noise levels in a small sensor – but the company clearly feels the new sensor design can accommodate the higher pixel count. The maximum sensitivity is capped at ISO 3200 (ISO 6400 in expanded mode), presumably with this in mind. The 30x zoom lens has a 24-720mm equivalent focal range and a maximum aperture of f/3.3-6.4. It too has a 5-axis hybrid optical image stabilization system and 'Lightspeed' autofocus technology with DFD (Depth from Defocus) feature. Put simply, this compares two images with different focus points to work out how far and in which direction to shift the focus. Like the TZ100, the TZ80 shoots 4K video and offers Panasonic's 4K burst mode and Post Focus features for 8MP stills. It too has an electronic viewfinder built in, full manual exposure modes and the ability to shoot raw files. The TZ80/ZS60 goes on sale in mid March at £359/US$499.99.